E.W. Pratt Chargers player Kimmy Sondrup hits the ball as Grace Pardell of the St. Andrew’s Saints of High Prairie defends on the other side of the net. The E.W. Pratt Lady Chargers faced some strong competition at the 29th annual Pratt Invitational Volleyball Tournament Sept. 30 and Oct. 1. The girls lost 25-3, 25-7 to Glenmary of Peace River in the semifinal after winning their first four matches. “They played very hard over the weekend,” says coach Kim Elliott. High Prairie won both their matches in their pool, as they defeated Grande Cache 25-21, 25-14; and the St. Andrew’s Saints of High Prairie 25-20, 25-14. The Pratt girls defeated Ridgevalley 25-12, 25-15 in the quarter-final. 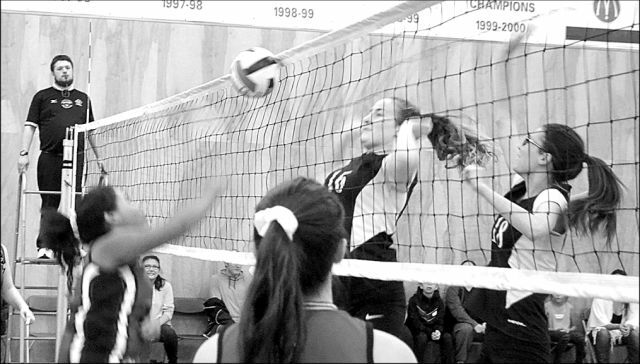 Meanwhile, St. Andrew’s defeated Grande Cache 25-22, 26-14 in the pool but lost to Pratt and G.P. Vanier of Donnelly. 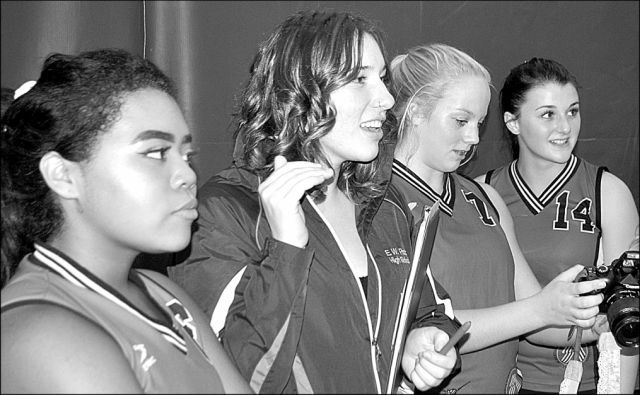 Starting for the Charger girls are Julia Isaac, Taneille Crooks, Destiny McVey, Katrina Reade, Zoey Blacha and Amber Cottingham. Time-out for Pratt! Left-right are Kimmy Sondrup, head coach Kim Elliott, Grayce Keay, and Destiny McVey.